The “Gordon Star Sapphire” and the “Gordon Sapphire” are two different blue sapphires weighing 52 carats and 50 carats respectively, that once belonged to Aron S. Gordon, the founder of Gordon Jewelers, from whom the two blue sapphires get their names. While the “Gordon Star Sapphire” was set in a pendant ring, the “Gordon Sapphire” was set in a pendant to a necklace, that was detachable and could also be worn as a brooch. The “Gordon Sapphire” is an emerald-cut blue sapphire with a more intense blue color than the “Gordon Star Sapphire” and weighing approximately 50 carats. With the increase in the intensity of the blue color there is a corresponding decrease in its translucency and clarity. Sapphires belong to the group of minerals called corundum, which is a crystalline form of aluminum oxide. Pure corundum is colorless. However if some aluminum atoms in the crystal structure are displaced by iron and titanium atoms, the corundum acquires a blue color. Greater the concentration of iron atoms in the crystal, stronger is the blue color produced. Sometimes blue corundum can also contain another impurity called rutile, which imparts a milkiness to the stone known as silk. The rutile fibers can exists as stacks or bundles of fibers. The stacks are arranged in a three-fold pattern, each stack reflecting incoming light to form a single streak of light. Thus the three stacks of rutile, will form three streaks of light intersecting one another at the center, forming a six-rayed star. This phenomenon is known as asterism, which is responsible for the star effect produce by star sapphires. The “Gordon Star Sapphire” originated either in Burma or Sri Lanka ? The clarity and distinctness of the star depends on the concentration of rutile in the gemstone. When the concentration of rutile is higher as in Burmese and Sri Lankan star sapphires, the stars produced are clear and distinct. However, sapphires originating in Africa, Thailand and some other countries do not have enough rutile, and the stars produced are not distinct. Thus going by the clarity and distinctness of the “Gordon Star Sapphire” we may predict that the stone most probably originated either in Burma or Sri Lanka. Sapphires crystallize in the trigonal crystal system forming elongate hexagonal prisms, but most naturally occurring sapphires may have modified often rounded shapes due to wearing by water as they are carried long distances by rivers and streams. The hardness of sapphires is 9 on the Mohs scale, and their excellent toughness and durability make them suitable for setting in jewelry either alone or in combination with diamonds. The specific gravity of sapphires vary from 3.99 to 4.02. Sapphires have two distinct refractive indices, 1.761 and 1.769 and birefringence which is the difference between the two is 0.008 which is low. Hexagonal, tetragonal and trigonal crystal systems normally exhibit birefringence. Dispersion of sapphires is 0.018, which is also low. Dispersion in gemology is a measure of the degree of “fire” or color exhibited by a gemstone. The “fire” of a gemstone also depends on the cut angles, the lighting environment, the refractive index and the viewing angle. Diamonds have a very high dispersion equivalent to 0.044. Thus diamonds have much more fire than sapphires. Therefore fire in sapphires can only be induced by applying suitable cuts that can create the appropriate cut angles that induces fire, by increasing the number of facet interactions light undergoes inside the stones. Pleochroism is very strong for sapphires. Pleochroism is the optical phenomenon in which a colored gem or crystal appear to have different colors when observed at different angles under a petrographic microscope. In the case of blue sapphires the colors that appear are violet- blue to lighter greenish-blue. Ultra-violet fluorescence of blue sapphires varies wit the iron content. Most blue sapphires are inert to ultra-violet light and do not show any fluorescence because of the high iron content. But some blue sapphires, particularly those originating in Sri Lanka show an orange or red fluorescence in long wavelength ultra-violet light due to their low iron content. The “Gordon Star Sapphire” and the “Gordon Sapphire” first came to light in the year 2002, when both pieces of jewelry on which the stones were set came up for auctions at Sotheby’s Auction House in New York in April 2002. The country of origin of the two sapphires are not known. 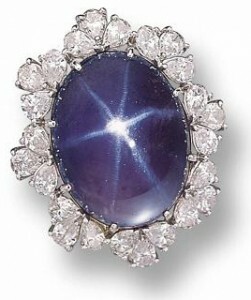 The oval-shaped cabochon-cut “Gordon Star Sapphire” weighing approximately 52 carats was set in a pendant ring, mounted in platinum and surrounded by 24 pear-shaped diamonds, weighing approximately 6.60 carats. The pear-shaped diamonds were arranged in eight triads, which were strikingly similar to one another due to uniformity of the size and shape of the diamonds. The ring shank was said to be detachable and the pendant loop retractable. The pre-sale estimate of the piece of jewelry was placed at $ 7,000 to $ 9,000. The emerald-cut 50-carat “Gordon Sapphire” was set as the centerpiece of a pendant, surrounded by a cluster of smaller diamonds of various shapes and sizes. The cluster consisted of 10 marquise-shaped diamonds, 26 pear-shaped diamonds, 7 round-shaped diamonds and 25 baguette diamonds, with a total weight of approximately 14.50 carats. The all-diamond necklace was set with 56 marquise-shaped diamonds, 51 round-shaped diamonds and 4 pear-shaped diamonds, with a total weight of approximately 22.50 carats, mounted in platinum, and having a length of 17 inches. The pendant was said to be detachable and could also be worn as a brooch. The pre-sale estimate of the necklace was $ 50,000 to $ 70,000. Aron S. Gordon was born in 1911 in Houstan, Texas, and completed his education at the University of Texas. In 1930, at the age of 19 years he joined his father’s jewelry business, that consisted of two jewelry and pawn Stores, which his father founded in 1905. Gordon was quick in picking up the technicalities of the jewelry trade, and set about expanding his father’s business. However with the outbreak of World War II, Gordon joined the United States Navy, and was stationed in Pearl Harbor. He served as an officer on the staff of Admiral Chester Nimitz. After the end of the war Gordon returned to Houston, where he took charge of the family business again and embarked on a vigorous program of expansion. He introduced a lot of innovative trade practices such as setting up stores in malls and shopping centers, and extending credit to his customers, the first jewelry company in the United States to do so. In 1961, his jewelry chain became the first publicly owned company, and in 1968 the company became the first jewelry company to be listed in the New York Stock Exchange. The company now known as the Gordon Jewelry Corporation had grown into a mighty chain of jewelry retail outlets, the second largest in the United States, consisting of 650 stores in 43 states and Puerto Rico. In 1970, Gordon took over the company’s presidency, and remained so until 1984, when he became the co-chairman of the board, a position which he held until the sale of the company in 1989. Subsequently, he entered the real estate development business, and became the chairman of the board of GORCAP, L. L. C. a real estate development company, a position which he held until his death in 2001. His son Thomas became the president and CEO of this company. While being dedicated to the development of his family business, Gordon also sacrificed part of his time to the development of the jewelry industry in general, by serving on the Jewelry Industry Council Board and also as director of the Retail Jewelers of America from 1967-1970. He was also a member of the exclusive 24 Karat club of New York. Both Aron Gordon and his wife Anaruth were avid collectors of Art works, artifacts, and jewelry, and traveled extensively from the late 1940s to 1980s. Probably it was during this period they acquired both the Gordon Star Sapphire and the Gordon Sapphire. In recognition of their contribution to the development of the Arts, Gordon and his wife were appointed to the board of trustees of the Museum of Fine Arts in Houston. Gordon’s interests also extended towards the performing arts, and he became a founder member of the Houston’s Performing Art’s Association. He was also a member of the advisory board of the Houston Symphony, and supported the Houston Youth Symphony and Ballet. According to his son Thomas, Gordon always believed in giving back something in return to the city and its inhabitants and to the society in general, that had made him successful in life. Perhaps it was in this context that Gordon embarked on a program of community service, supporting various worthy causes throughout Houston. Among the organizations that received his support included, The Juvenile Diabetes Foundation, March of Dimes, the Anti-Defamation League, the DePelchin Faith Homes, and the Children’s Hospital. He also served on the advisory board of the End Hunger Network, and the board of visitors for the M. D. Anderson Cancer Center. He was elected a board member of the National Jewish Hospital in Denver in 1965, and was appointed a life board member of the St. Joseph Hospital Foundation. In the year 1993, Aron Gordon was elected into the Texas Business Hall of Fame. Anaruth Gordon pre-deceased him in the year 1995, and Gordon passed away in 2001. 1) GEO347K GEM NOTES – Corundum, Department of Geological Sciences, University of Texas, Austin.